NEW YORK, New York — We began the day with a visit to the legendary toy store FAO Schwarz. Founded in 1862 by German immigrant Frederick August Otto Schwartz, New York's most famous toy store is the oldest toy retailer in the U.S. It was the first store in New York to host visits with Santa and a pioneer in the concept of "entertainment retail," the notion that visiting a store should provide a memorable experience for its customers. Within the store are many unique mini-shops featuring huge selections of unique merchandise or allowing customers to create their own custom toys, from jigsaw puzzles to Muppets to Barbies. 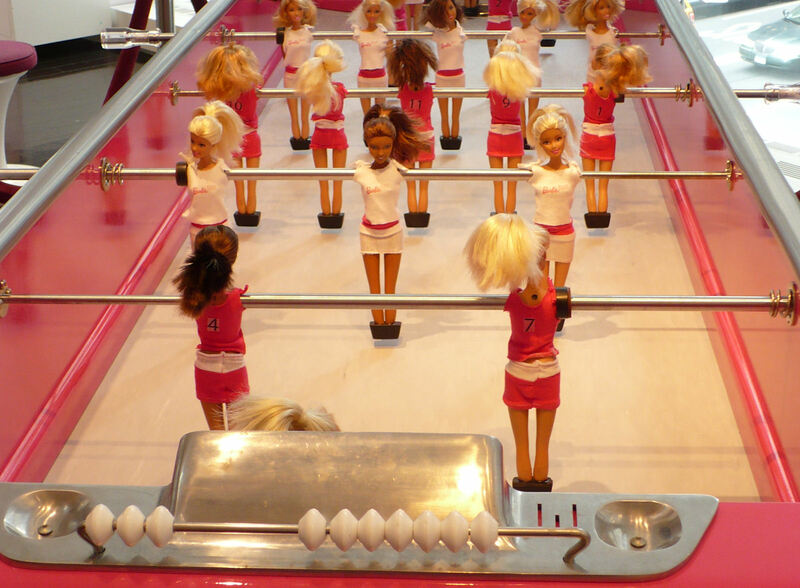 If you have $25,000 you're eager to get rid of, you can purchase your very own one-of-a-kind Barbie foosball game. 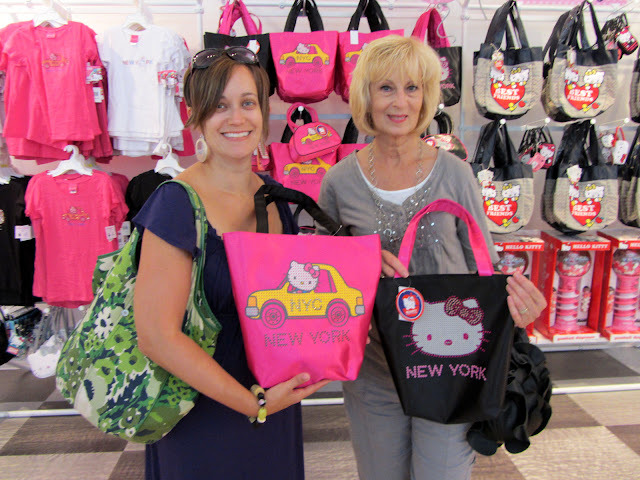 In this ocean of tantalizing toy temptations, we managed to resist all but two small purchases. However, we all enjoyed the full measure of the founder's entertainment philosophy. As difficult as the adorable plush animals were to leave, we had lots of ground to cover. We headed underground to the fabulous New York subway. With our seven-day unlimited ride passes, the subway was a great method of transportation and it all seemed so much easier with some experience behind us. On our way up 5th Avenue toward the Metropolitan Museum, we encountered a group of gawkers on the sidewalk along Central Park. 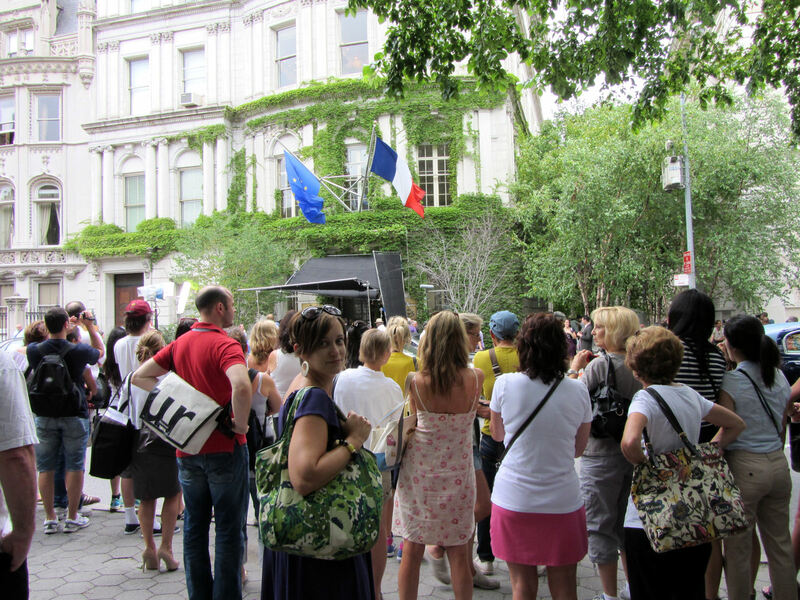 They were watching the taping of a scene for an episode of the CW network's Gossip Girls across the street. For the taping, the French consulate had been transformed into a consulate for Monaco with the temporary addition of an appropriate sign and careful framing by the videographers to exclude the French flag which was still flying from the building. We couldn't gawk long because another New York icon beckoned, the legendary Metropolitan Museum of Art, which welcomed its first visitors in 1870. Today the museum hosts five million visitors annually, making it the most visited art museum in the U.S. and ranking third worldwide. After standing in an interminable line, we visited a special exhibit by the late fashion designer Alexander McQueen, whose fashion house designed Kate Middleton's royal wedding dress. We were uniformly amazed by the variety of surprising materials and styles employed in the designs on display-- shells, feathers, human hair, vulture skulls, aluminum, worms, horsehair, gold bullion, fiberglass, wire, crocodile heads, and impala horns, among others. 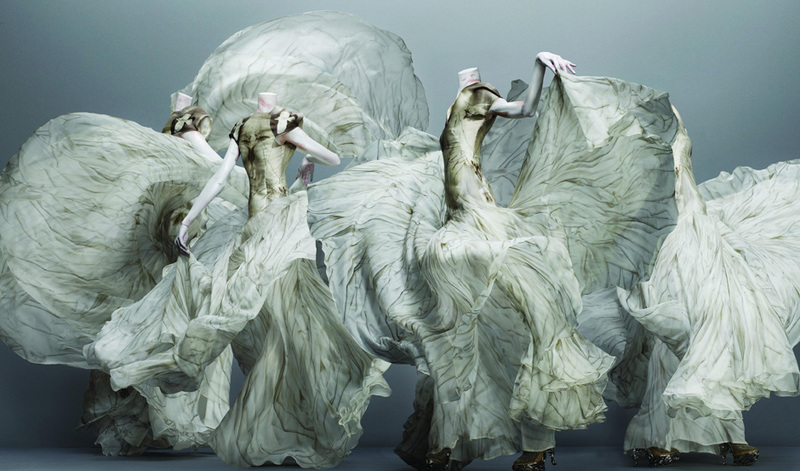 Check out some photos of these fascinating fashions on the Met web site. Near this special exhibit, we located the section of the museum's permanent collection that most interested Jeanne— the Impressionists. She was certainly not the only one of us eager to view some of these amazing paintings, but she definitely seemed to glean the most from them, as she thoughtfully studied each of the 15 Van Gogh works on exhibit, as well as paintings by Monet, Manet, Seurat, Cezanne, and others. We couldn't leave the Met without a visit to the fascinating Temple of Dendur, a shrine to two brothers who drowned in the Nile River during Roman times. Constructed on the Nile in 15 BC, the temple had to be removed from its original site in 1963 to prevent its submersion when the Aswan Dam was completed. In recognition of American assistance in saving various other monuments threatened by the dam's construction, Egypt presented the temple and its gate as a gift to the United States. The temple was dismantled, packed in crates, and shipped across the Atlantic. 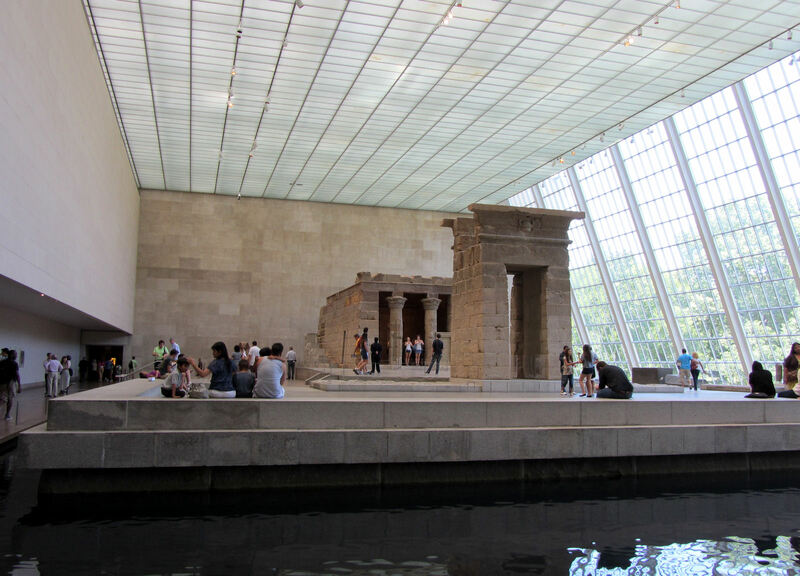 The Met won a bidding war to exhibit the temple and designed a special room with a reflecting pool representing the Nile to house the structure. Though the Met's exhibits could easily have kept us entertained for another week or more, we had to move on to lunch, ensuring there would be plenty to visit on our next trip to this peerless museum. On our way to the exit, we passed through the sculpture gallery in the American wing with its superb exhibit of works by U.S. artists. That's when Jeanne challenged us to a little performance art: select a sculpture and imitate it. It was great fun and soon we observed other visitors following our lead. You can try it also. As part of Google's Art Project, using their street view technology and high resolution images, you can take a virtual tour of this very sculpture gallery and try a little performance art yourself. Meanwhile, leave a comment here on our blog, voting for which of the interpretations above is most authentic— 1, 2, 3, or 4, from L to R.
After a quick visit to the Met's rooftop garden, we headed off to lunch at Caffe Grazie on E. 84th Street. Located in a converted townhouse, the restaurant was very convenient to the Met and offered a nice variety of choices for a light lunch. We especially liked the "Bento Box" option of two perfect size samplings of savories plus a sweet. By the time we finished our meal after 3 p.m., the room we were in had emptied, so we telephoned my mother to sing 'Happy Birthday' to her, prompting our server to rush into the room offering a candle. Back to the subway, we rode the train down to Greenwich Village, where we explored the area, including a nice little bar that offered some respite from the heat. After cooling off we made a sojourn to Washington Square Park. 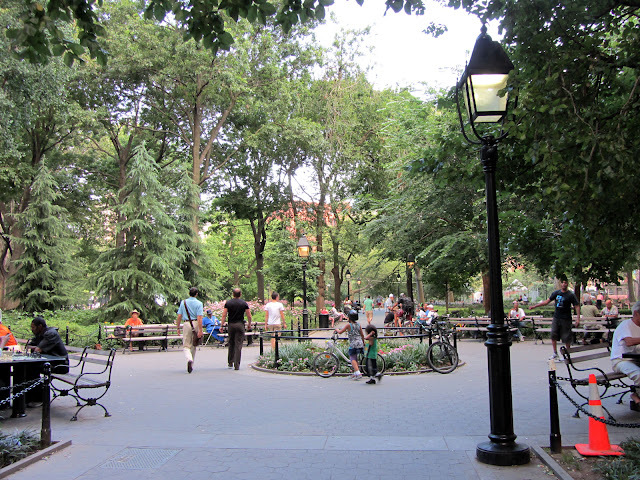 Located at the end of Fifth Avenue, Washington Square is one of the best-known of New York's 1,900 public parks. It measures almost 10 acres and has long served as a site for meeting friends and enjoying cultural activities. Though it is now in the center of the New York University campus, Washington Square continues to operate as a public park, welcoming locals and tourists, and serving as a great place for people watching. By the time we left the park at 7 p.m., we were ready to find some dinner and get back to the hotel for a shower to rid ourselves of the grimy mementos of a very hot day in the city. Before we reached the nearest subway station, Mother Nature intervened and changed the order of things a bit. A sudden downpour blew up with no shelter immediately available, so we had our shower before we returned to the hotel. We hailed one of New York's yellow carriages for a taxi ride back to the hotel. Drenched and wringing water from our clothes, we were treated to a beautiful rainbow as we made the trip back to Midtown. After changing into dry clothes, we headed to the nearby Food Emporium, picked up a bottle of wine and some meals from their gourmet shop and enjoyed a quiet and economical meal, eating in before falling into bed exhausted to rest up for another day of escapades New York style.